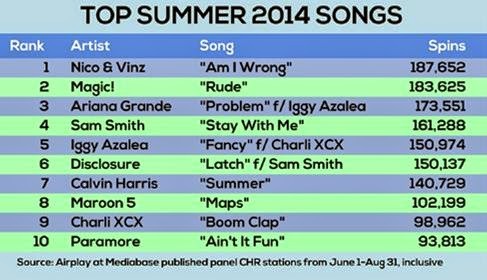 Blitz Magazine: What was the top Song of Summer 2014? What was the top Song of Summer 2014? No definitive song but an edgier sound emerged at CHR this summer. CHR didn’t net a song that epitomized the summer of 2014 but it did give rise to a new crop of edgier, rhythmic acts that offer a hint of where the format is heading. Five of the top six most-played CHR songs of the summer were from debut releases, including Iggy Azalea, whose high-velocity rap put her own “Fancy” in the summer’s top five and helped propel Ariana’s Grande’s “Problem” into the top three. “Fancy” was inescapable this summer, shooting to No. 1 at CHR, rhythmic and urban. “This was her summer more than anybody’s,” Radio Animal Media Consulting president Dom Theodore says. It was a big summer for crossovers as the top five most-played songs all went to No. 1 at other formats. Even as EDM continued to dominate CHR, smashes from Azalea, Rude! and Sam Smith helped slow the format’s tempo down with lower-BPM sounds. In sharp contrast to 2012, when pure pop ruled, this summer saw CHR move away from the musical center. “The cycle is starting to skew more rhythmic, with top 40 and hot AC moving a little farther away from each other — but certainly still sharing the giant hits,” says MusicCrunch partner Anthony Acampora. That signals the arrival of the musical extremes, according to Theodore, when edgier hip-hop and guitar-based pop rock lift rhythmic CHR and hot AC, but are sometimes tougher for CHR to marry together. “We are starting to see the emergence of the extremes for sure,” Theodore says, pointing to Nicki Minaj’s “Anaconda” as evidence of a return to edgy novelty songs.